On November 20th 2017, Marvell technology group entered into a definitive agreement to acquire Cavium Inc for $40.00 per share in cash and 2.1757 Marvell common share for each share of Cavium. At an implied enterprise value of $6 billion the deal will be funded with cash on hand of both companies, $1.75 billion of debt financing, and equity. Cavium is up 35% since the proposal went public and is trading ~10% above the announced purchase price of $80 per share. The merger combines Marvell’s leading HDD and SSD storage controllers, networking solutions and high performance wireless connectivity products with Cavium’s leading multi-core processing, networking communications, storage connectivity and security solutions. Marvell has been facing challenges in the hard disk drive storage market and a merger with Cavium would lower its dependency in that market segment while increasing its exposure to the networking and microprocessor market. The combined company is expected to generate at least $150 to $175 million of annual synergies within 18 months and be accretive to revenue growth, margins and non-GAAP EPS. On November 22nd, 2017 Zhongtian Financial Group entered into an agreement to purchase a 25% stake in Huaxia Life Insurance for $4.6 billion USD. The deal values Huaxia Life Insurance at $18.6 billion dollars and is an indication that Chinese regulators are cleaning up some of the questionable deals executed in the past. Zhongtian stated that the transaction would constitute a major reorganization of assets and that the specifics would be based on further due diligence and auditing. Chinese debt obligations have soared in the past two years because the central bank expanded credit and well known acquirers overextended their debt levels to acquire assets globally. As a result the new Xi administration has been compelling highly levered companies to solidify their balance sheets. Huaxia Life Insurances is indirectly controlled by a missing Chinese financier, Xiao Jianhua, who was pressured by regulators earlier this year to sell off some controlling stakes in his financial institutions to reduce risks and allow early investors to exit for cash. Huaxia was targeted by regulators last year for selling high-yield short term investment products accounted for 75% of its total business. On November 22nd, 2017 reports surfaced that DaVita Inc is exploring the sale of DaVita Medical Group at an implied enterprise value of ~$4 Billion USD. Sources have said that the deliberations are in an early stage and may not lead to a divesture. The DaVita Medical Group manages groups of physicians across the United States who care for approximately 1.7 million people. The sale would be a retreat from the physician services sector which DaVita had expanded into over the past few years through acquisitions of HealthCare Partners for $4.42 billion and Everett Clinic. Some analyst believe some logical strategic buyers would be both national health insurers and local hospital systems who may pay between 10-12x EBITDA. At that multiple and an EBITDA of $299 million the company would be valued between $3 and $3.6 billion before synergies. The sale of DaVita Medical Group would transform the company into a pure-play dialysis provider whose annual operating income has declined by 4% over the past 5 years. Acquirer: Alibaba Group Holding Ltd.
On November 20 th 2017 a consortium led by Kofu Internaitonal announced the sale of a 36.16% stake in the Sun Art Retail Group to Alibaba Group Holding. Alibaba will pay ~$2.9 billion USD for the stake which values Sun Art Retail Group at ~$8 billion USD. Alibaba received a 24% discount for the shares from current shareholder Reuntex reflecting Reuntex’s and Auchan’s eagerness to get Alibaba on board. The acquisition is part of a strategic alliance with Auchan Retail and Ruentex Group to target opportunities in China’s $500 billion food retail sector. Alibaba coined the term “New Retail” to describe the strategy of combining online and offline operators to pool consumer data and enhance competiveness. Alibaba has invested upwards of $9.3 billion in brick-and- mortar stores since 2015 and currently operates 20 brick-and- mortar supermarket outlets. some of the properties as distribution centers for their online sales. 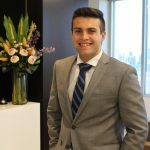 Bradley is an incoming 2018 summer analyst at Macquarie Capital in the metals & mining group in Toronto. He worked at Scotia Wealth Management for over a year in both full time internship and part-time positions. He will be graduating from UBC’s Sauder School of Business in 2019 with a major in finance and minor in statistics. Outside of academics he is studying for the CFA level 1 exam, an analyst for ACIIC—a student run investment organization—and a varsity baseball player.